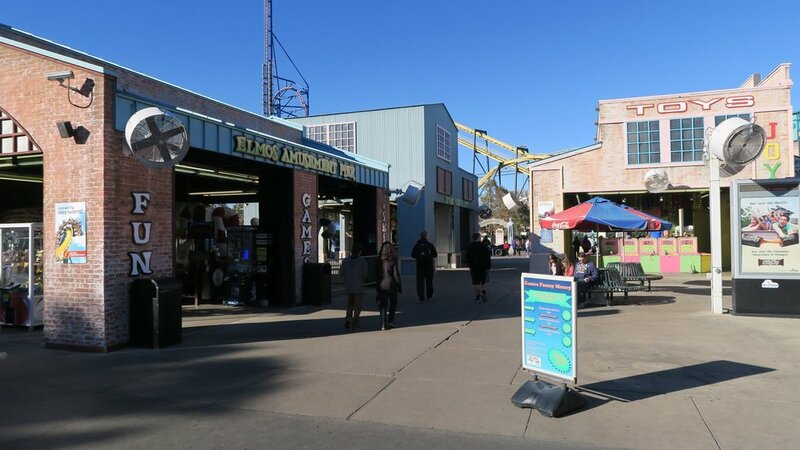 During the day, Six Flags Over Texas offers an atmosphere that is suitable for guests of all age. There are many activities available, such as karaoke and trick-or-treating, that are geared towards children. However, once evening sets on the park, the atmosphere turns into a more frightening experience. Once night falls the park experience is recommended for guests older than 12 years. Looney Tunes Spooky Town - Kids can meet the Looney Tunes characters and engage in a trick or treat event. Kid's Costume Party - A supermodel zombie walk show that is exclusively for guests 10 and under. 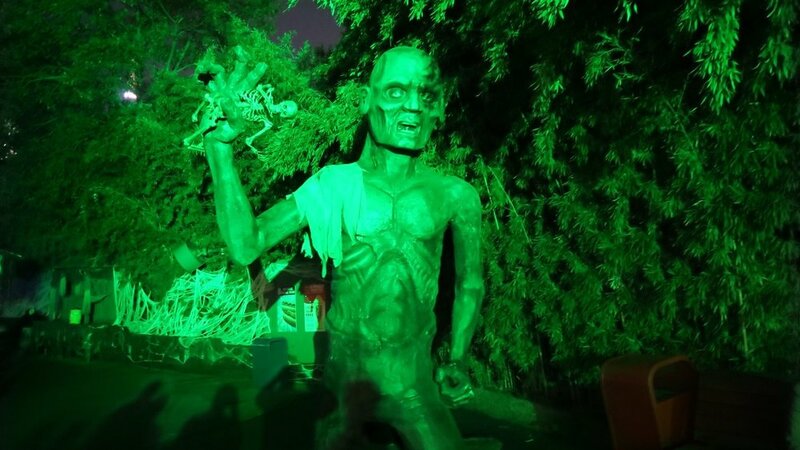 Six Flags Spooktacular Street Party - A kid-friendly dance party full of ghouls and zombies. Scary-Oke - A Halloween twist on guest-driven karaoke. The park provides a great line-up of live entertainment to enjoy throughout the day. Shows such as Arania's Nightmare are a huge hit and will play multiple times a day. We recommend arriving at theatres earlier than usual as Fright Fest shows are quite popular. More information regarding live shows can be found below. The park offers a handful of haunted houses at an extra charge. Guests can purchase single-house tickets or a wristband for entry to all houses. Other upgraded packages are available that will cut your wait time in half. If you are planning on enjoying the haunted houses we recommend looking at one of these upgraded packages once you arrive to the park. Since the park turns into a more mature-themed nature at night, there are a handful of ride closures. Happening at 6pm each evening, attractions such as Bugs Bunny Boomtown, other children rides, and water rides close for the day. As seasons progress, Six Flags Over Texas has added many more scare zones. During the day they remain untouched like most of the park. However, once night falls, all scare zones are filled with scary characters with the sole intent to frighten the guests around them. Please note that many park attractions cannot be accessed without traveling through various scare zones within the park. When does Fright Fest operate? Fright Fest will take place on select dates from September 23rd through October 31st. Please check out the park's official operating calendar for daily park hours. Can wear a full costume, mask, and face painting if accompanied by an adult family member. If this guest is alone or with same-aged children, then no masks or face makeup is allowed. Masks with "bloody" features are not allowed. Guests this age may only partially paint their face (no more than half the face can be painted). Can bring toy accessories including plastic swords, magic wands, crowns, and wearable ears. Toy guns, pitchforks, and objects with "bloody" features are not permitted. All toy accessories must pliable and non-sharp plastic. These guests can wear costumes. There are NO EXCEPTIONS to these rules: no masks, costumes cannot have inappropriate language or imagery, partial face paint is allowed as long as it does not disguise facial features (no more than half the face painted), no handheld accessories (guns, chains, swords, wands, etc.) of any kind are permitted. All costumes must be appropriate and family-friendly. Welcome to Arania's Nightmare, a Fright Fest classic, returns to the park for another season. Join Arania on her journey to find a new husband. Husbands one through thirteen have all met mysterious deaths. What will happen to husband number fourteen? Located in Southern Palace Theatre. Zombie A-Rock-Alypse: These not-so-dead beings take the stage at both Gotham City Stage and Silver Star Carousel Stage to put on a dance show that can be enjoyed by the whole family. The Awakening is everyone's notice that things are about to become incredibly scary around the park. Join around the Front Gate area as monsters from every scare zone in the park are unleashed into the night. Watch as park guests participate in a series of challenges to win prizes. Can these guests face the final challenge, "Squeal or No Squeal," to win the grand prize? Located at the Silver Star Carousel Stage. "Sliders" from around the park gather at the Gotham City Stage each evening to lurk around guests. They typically travel in packs so always watch your back. PLEASE NOTE: Haunted houses require an additional pass. These passes can be purchased on the official Six Flags website or inside the park. We hope you aren't afraid of the dark. Blackout puts its visitors in complete darkness throughout the whole duration of this haunted house. Beware of the other creatures lurking in the dark. Located in Gotham City. Located inside Texas Arena, Cadaver Hall Morgue is full of creatures that may not be so dead. Try to avoid as much as you can, though the staff in the morgue isn't any safer than those who were supposed to have passed on. Also located inside of Texas Arena lies the horrors of anyone who is scared of clowns. Cirkus Berzerkus is a maze of clown madness. Don't forget that you will have 3D glasses on the entire time. PLEASE NOTE: Scare Zones operate from 7:00pm until 1 hour prior to park closing nightly. Right at the front of the park stands Bio-Mech Sector, an old power plant. Nobody is too sure about what keeps happening at this old plant other than that people continue to disappear. In 1787, a terrible disaster happened in the Boomtown coal mines. Due to a dynamite mishap, the mine collapsed and all miners were trapped and killed. Their spirits became trapped in the mines forever. This side show was once the talk of the town. However, the most popular performers eventually left leaving nothing but the real freaks. Outsiders are not typically welcomed here. Located in USA. Beware as these mutated, human-sized monsters roam the Texas section. They sleep during the day and awaken at night to prey on the most frightened guests that dare take these pathways. Voodoo Swamp is quite the mysterious place. Take this path along the water and hope that you can see yourself to the other end. Many creatures lurk in this scare zone and they are well-hidden. Located in Tower. Texas Scare-a-Tory takes the wild, wild west to a whole new level. One day a plague quickly took over this flourishing town. Now all that is left are the angry souls of those who felt cheated. Have a question regarding Fright Fest? Contact us directly or connect with us on social media.